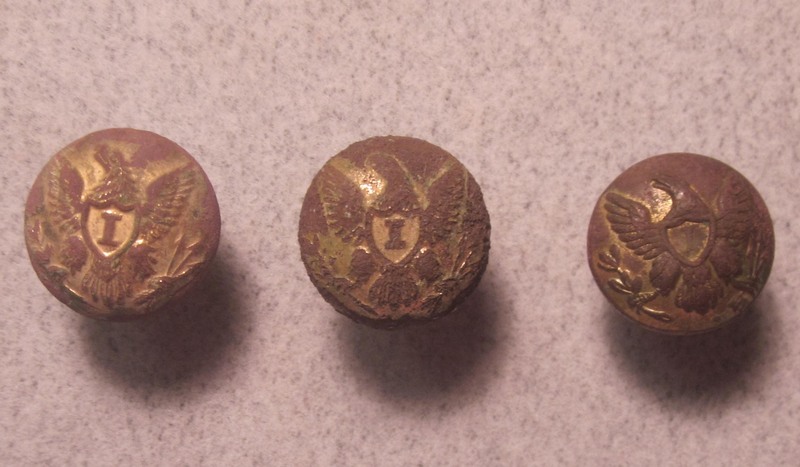 Eight cuff sized Union buttons. All have shanks and some gilt. 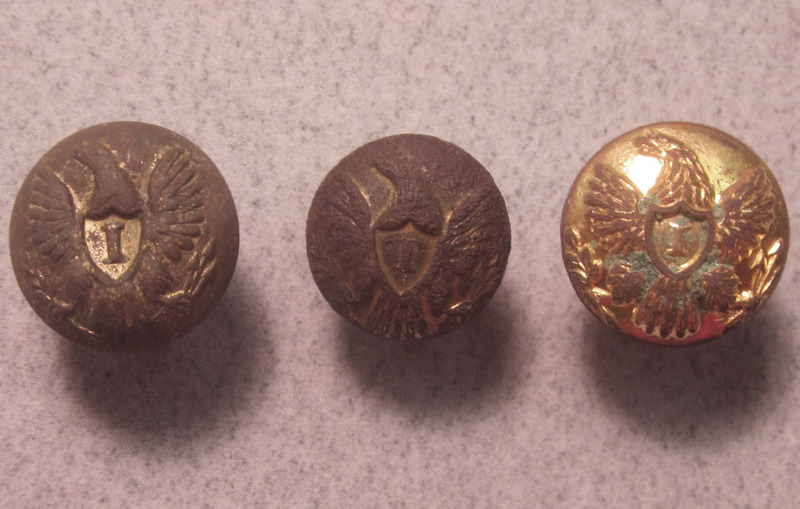 There are seven staff officer's buttons and one New York. Dug in Petersburg. 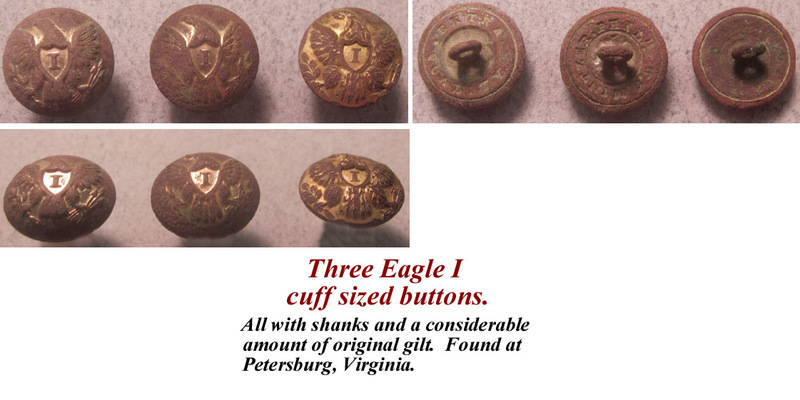 Three Eagle I cuff sized buttons. All with shanks and a considerable amount of original gilt. Found at Petersburg, Virginia. 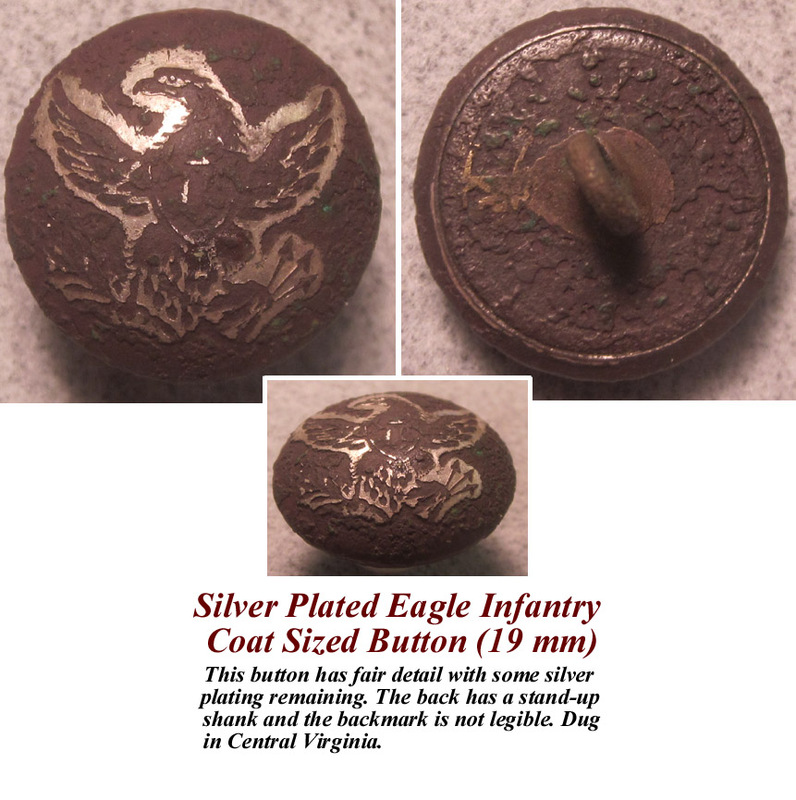 Eagle Infantry coat sized button. 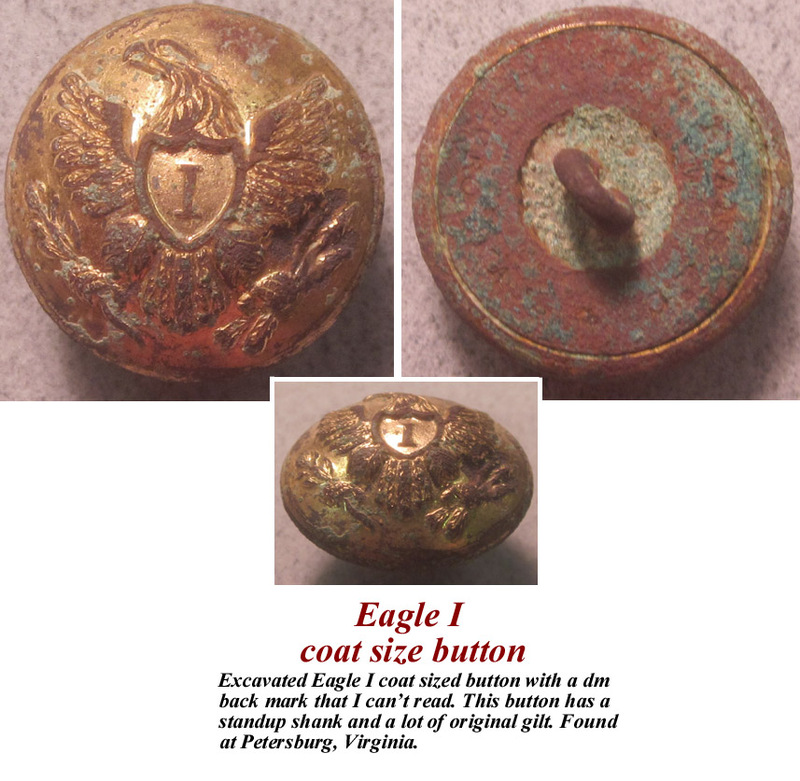 Excavated Eagle I coat sized button with a dm back mark that I can't read. 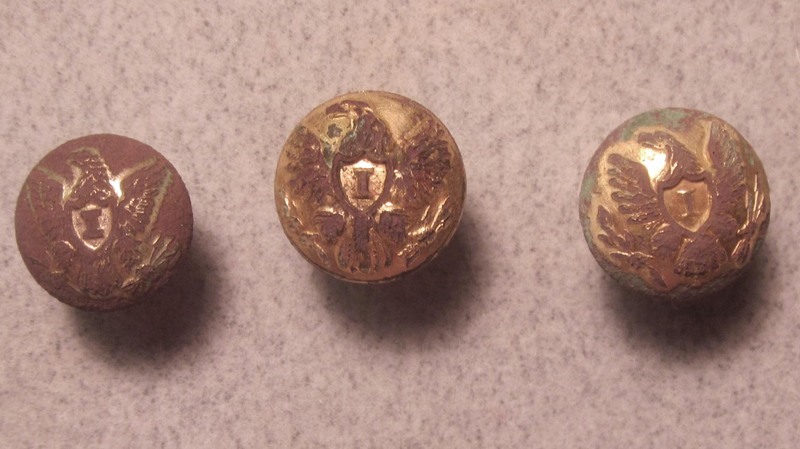 This button has a standup shank and a lot of original gilt. Found at Petersburg, Virginia. 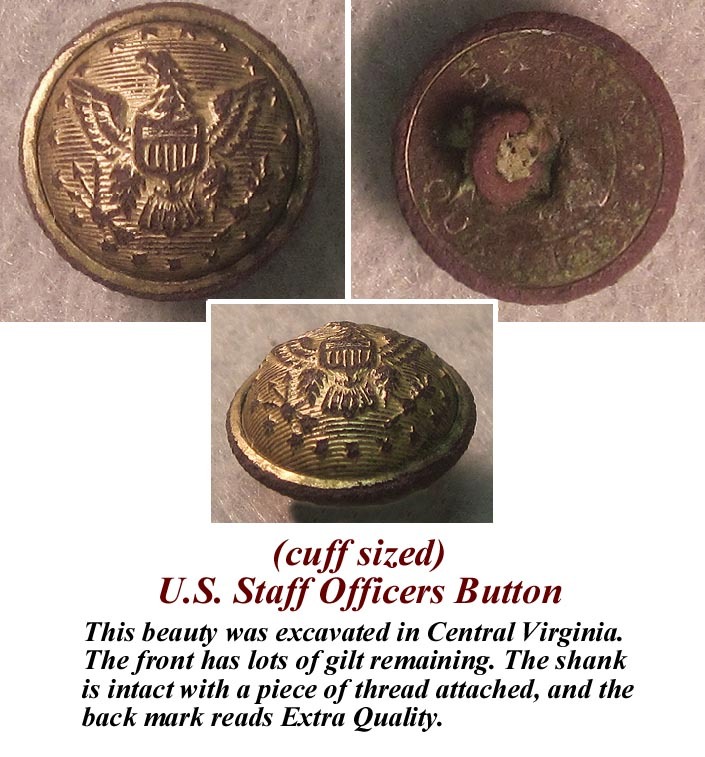 U.S. Staff button cuff sized. 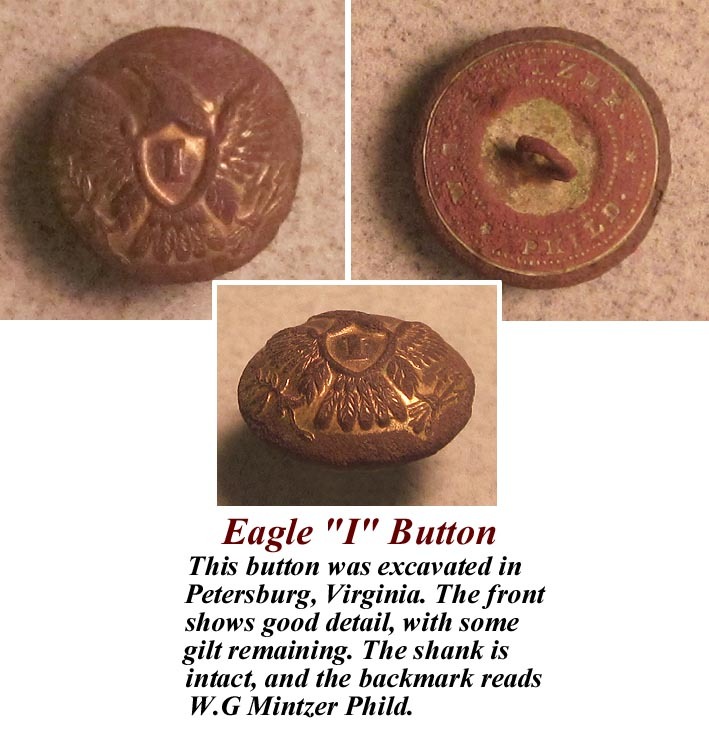 This button was dug in Central Virginia. Almost 100% of the original gilt remains on this artifact, which displays excellent detail. The shank is present and erect, which is not always the case with tin backed buttons. Excavated in Central Virginia. 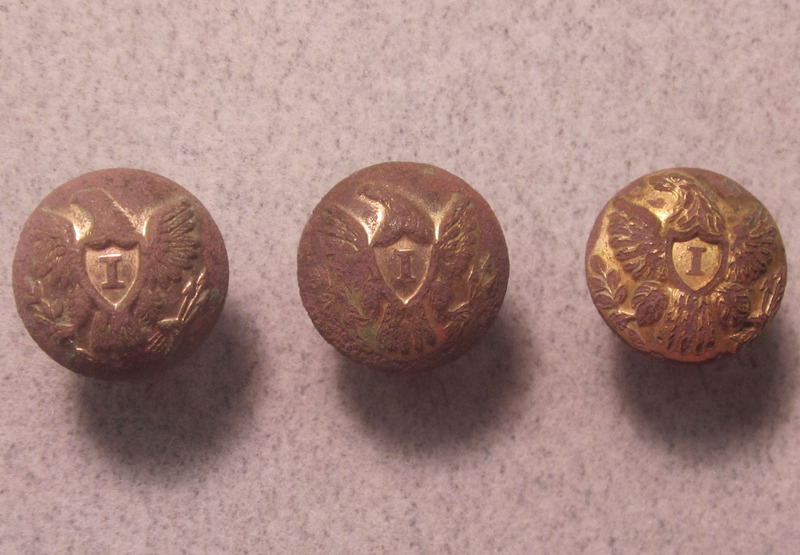 This nice button retains it's stand up shank, and much of it's gilt on the face. The back mark is unreadable, and overall it shows good definition. 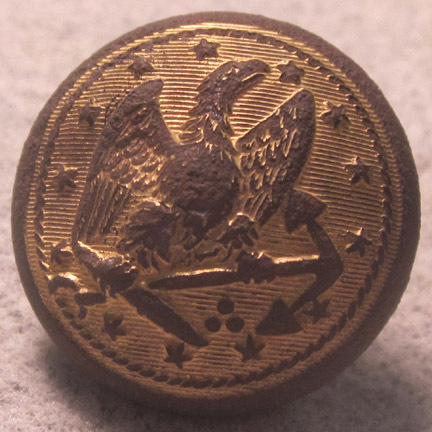 US Navy button (18mm) with bachelors ring. 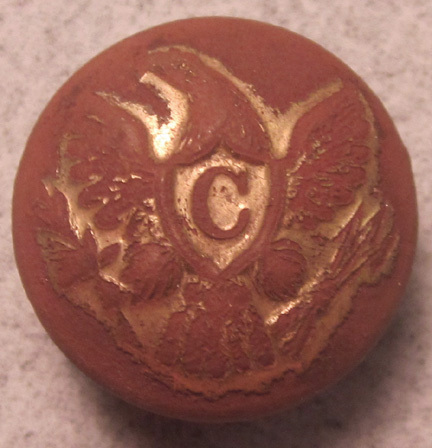 This button has excellent crisp detail and a lot of gilt remaining. The back has a stand up shank with bachelor ring and the back mark is Scovill Mfg. Co. Waterbury. Dug in Central Virginia. 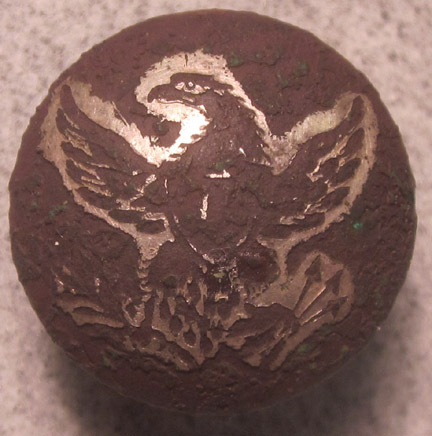 Silver Plated Eagle Infantry Coat Sized Button (19mm). 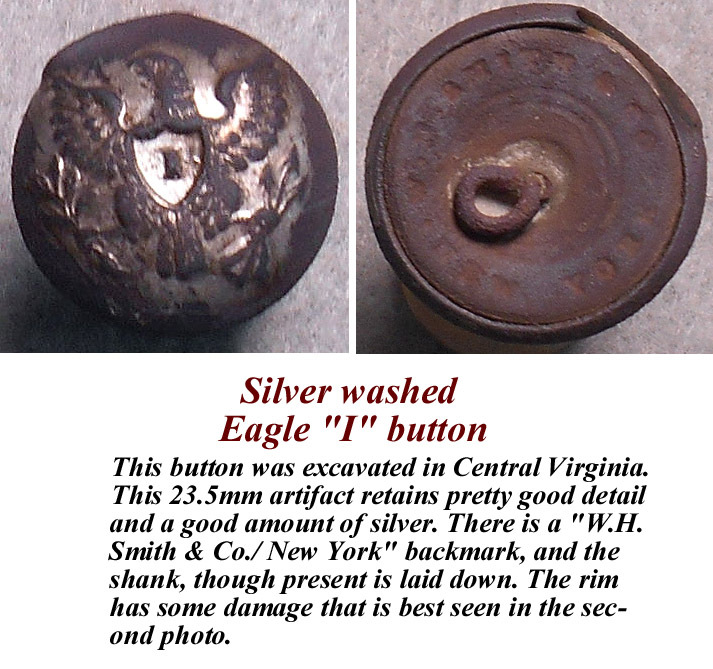 This button has fair detail with some silver plating remaining. The back has a stand-up shank and the back mark is not legible. Dug in Central Virginia. 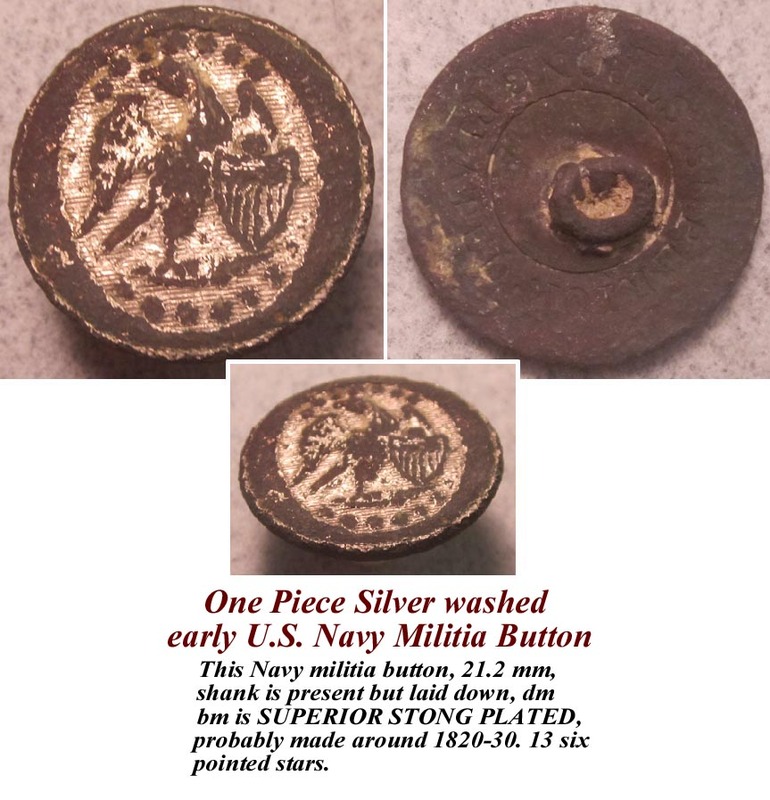 One Piece Silver washed early U.S. Navy Militia Button. 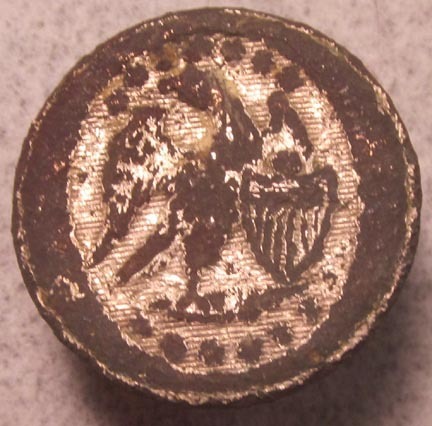 This Navy militia button, 21.2 mm, shank is present but laid down, dm bm is SUPERIOR STONG PLATED, probably made around 1820-30. 13 six pointed stars. Very nice U.S. Ordnance Dept. button (cuff sized). 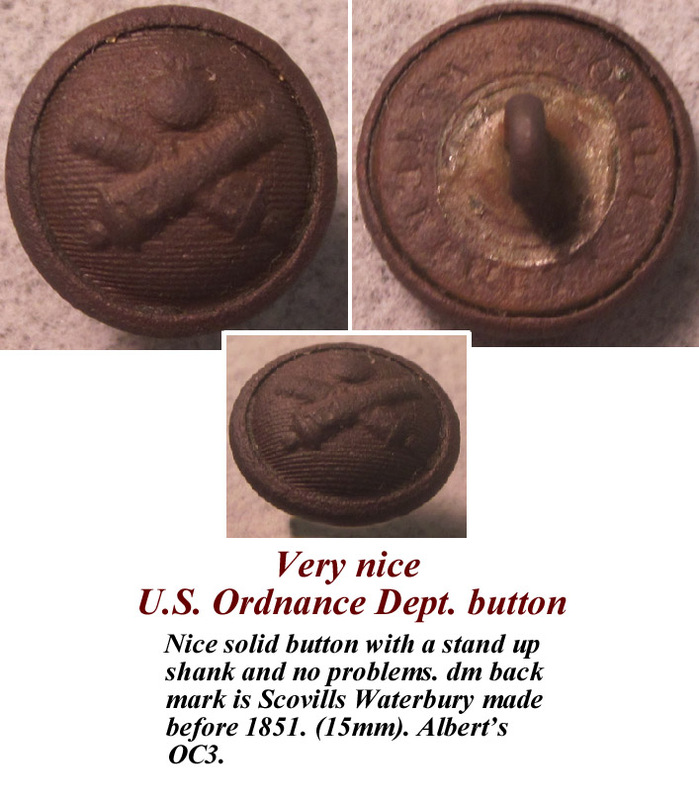 Nice solid button with a stand up shank and no problems. dm back mark is Scovills Waterbury made before 1851. (15mm). Albert's OC3. 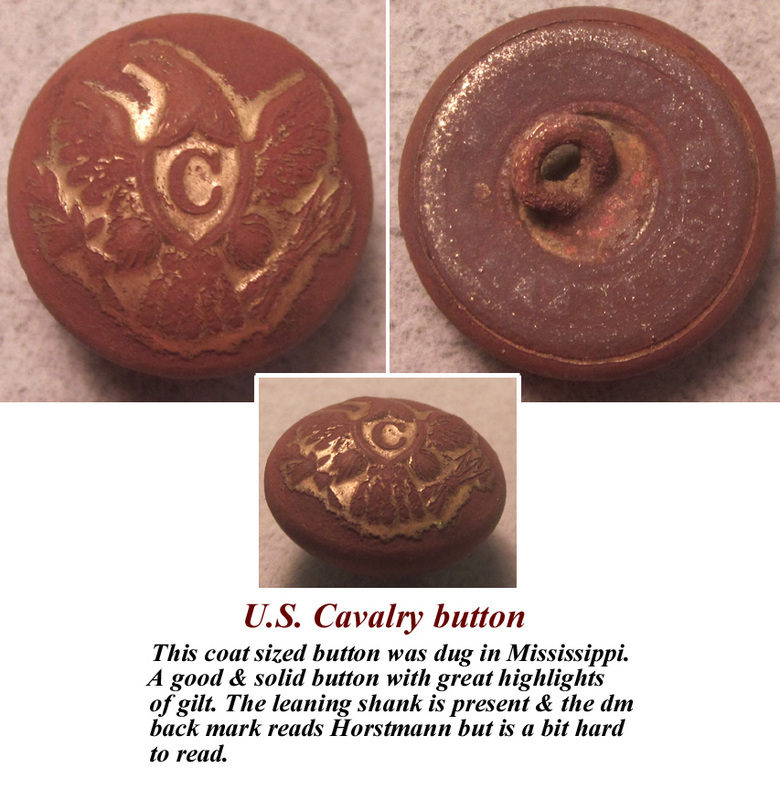 U.S. Cavalry button (coat sized). 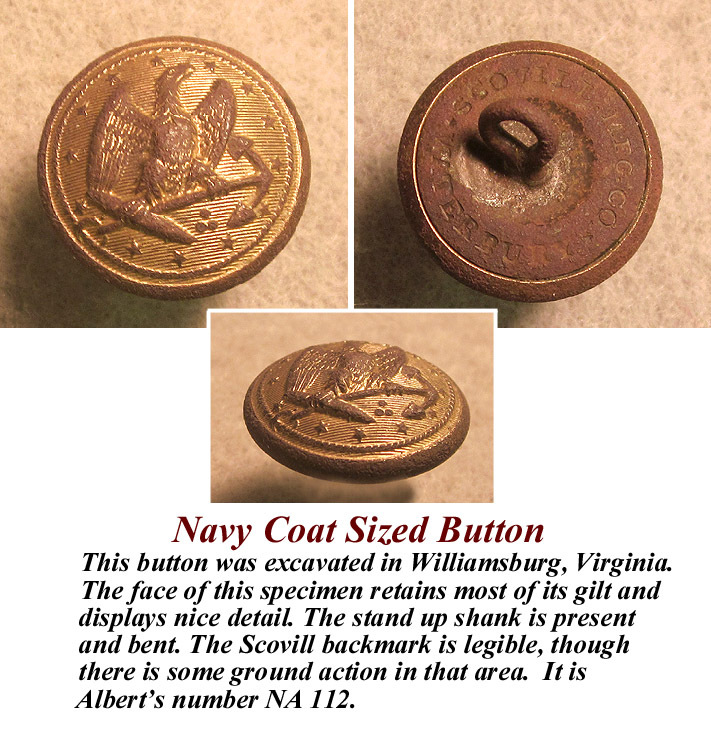 This coat sized button was dug in Mississippi. 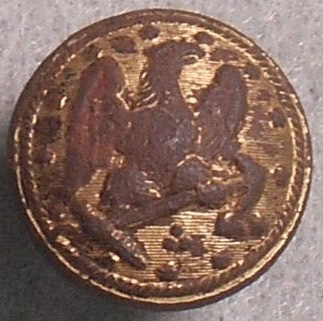 A good & solid button with great highlights of gilt. The leaning shank is present & the dm back mark reads Horstmann but is a bit hard to read. 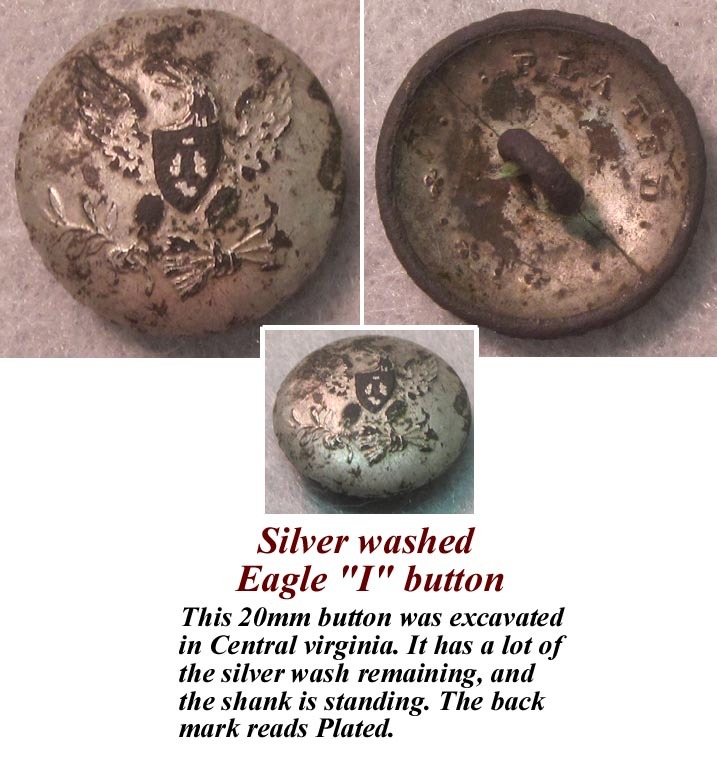 Rare Silver washed Eagle "I" button. 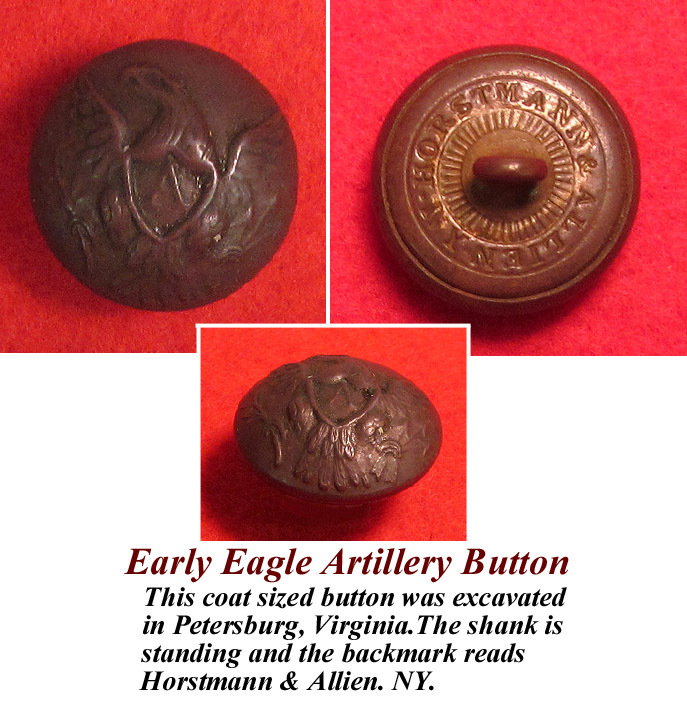 This button was excavated in Central Virginia. This 23.5mm artifact retains pretty good detail and a good amount of silver. There is a "W.H. Smith & Co./ New York" backmark, and the shank, though present is laid down. The rim has some damage that is best seen in the second photo. 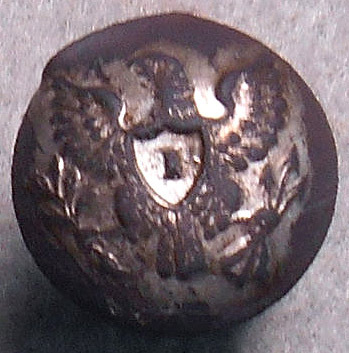 Silver washed Eagle "I" button (coat sized). 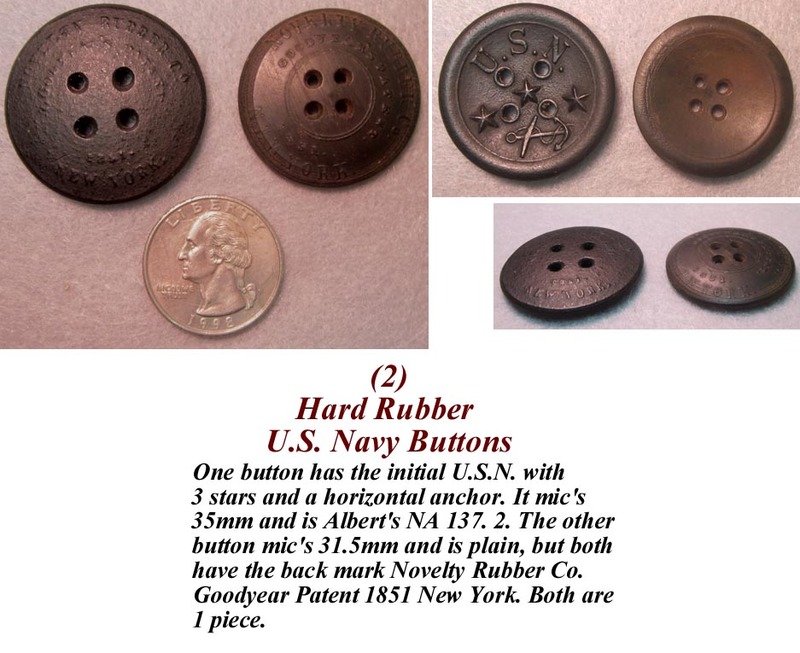 (2)Hard Rubber U.S. Navy Buttons. 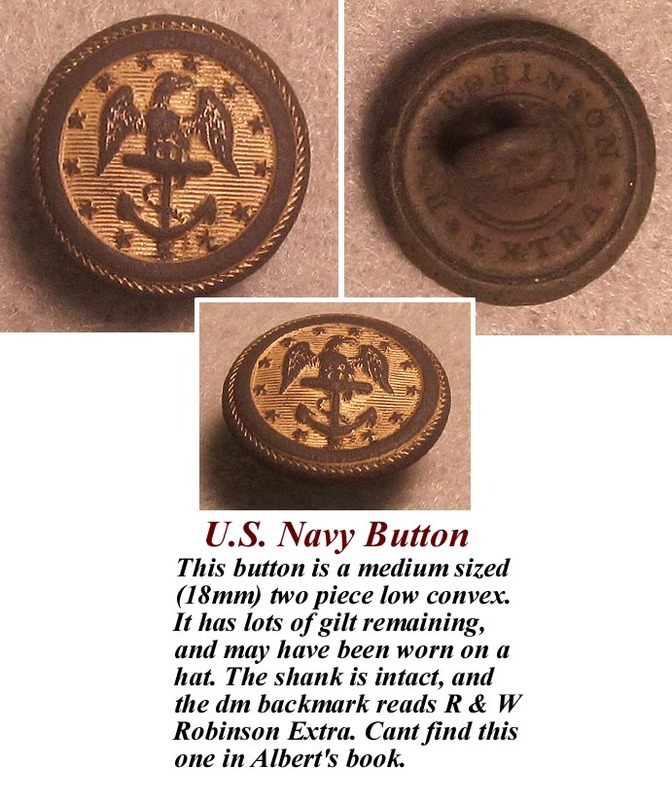 One button has the initial U.S.N. with 3 stars and a horizontal anchor. It mic's 35mm and is Albert's NA 137. 2. The other button mic's 31.5mm and is plain, but both have the back mark Novelty Rubber Co. Goodyear Patent 1851 New York. Both are 1 piece. 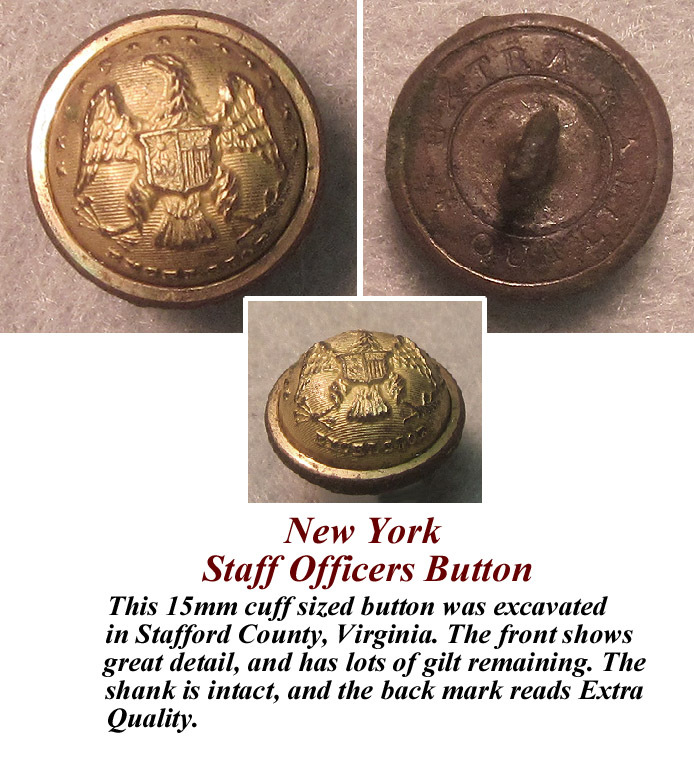 New York Staff Officers Button (cuff sized). 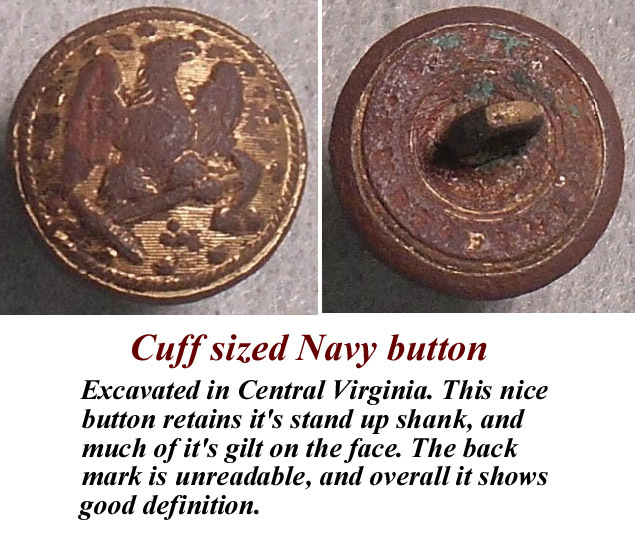 This 15mm cuff sized button was excavated in Stafford County, Virginia. intact, and the back mark reads Extra Quality. 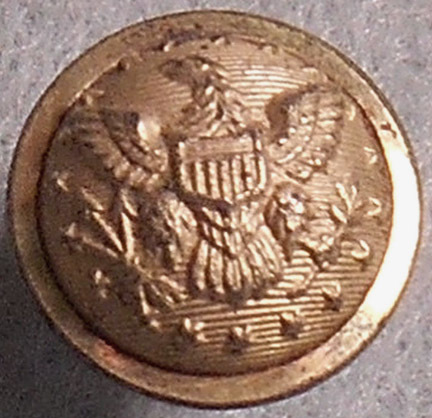 U.S. Navy Button (vest sized). 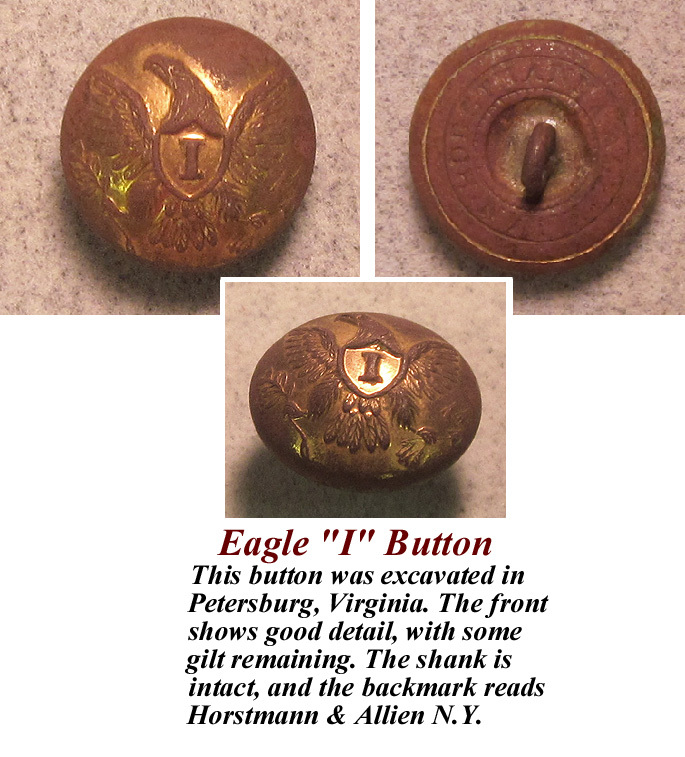 This button was excavated in Central Virginia. back mark is Scovill, but it is hard to see. 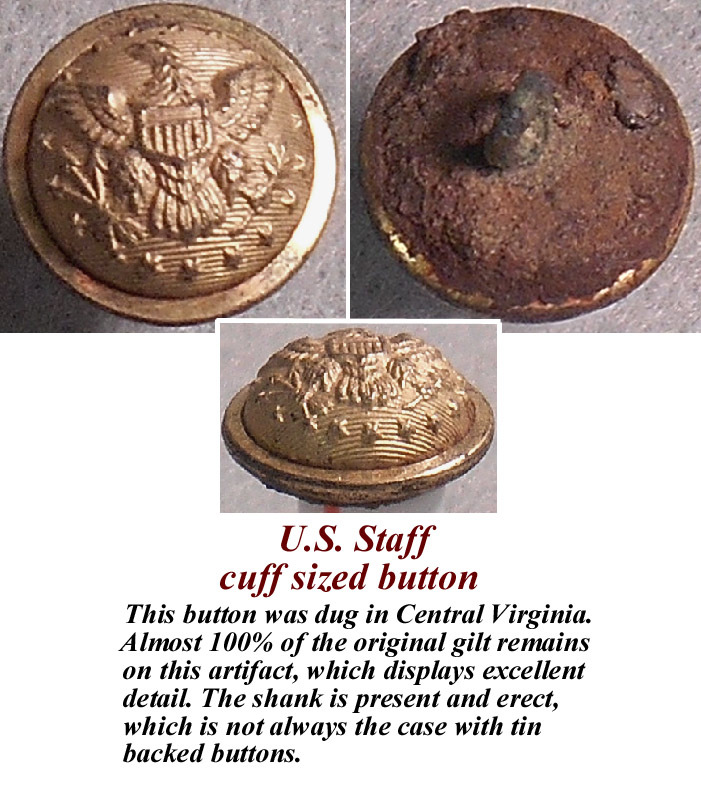 U.S. Staff Officers Button (cuff sized). This beauty was excavated in Central Virginia. back mark reads Extra Quality. 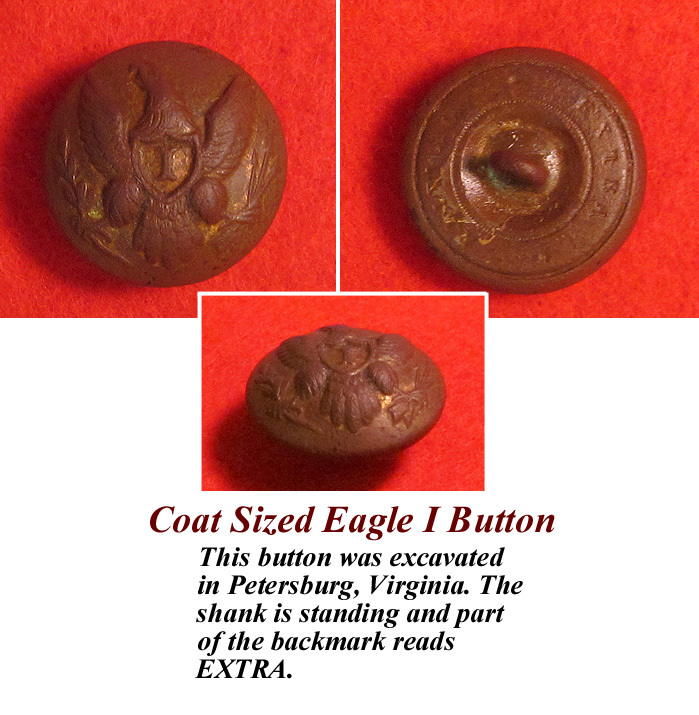 This excavated button is a medium sized two piece low convex. 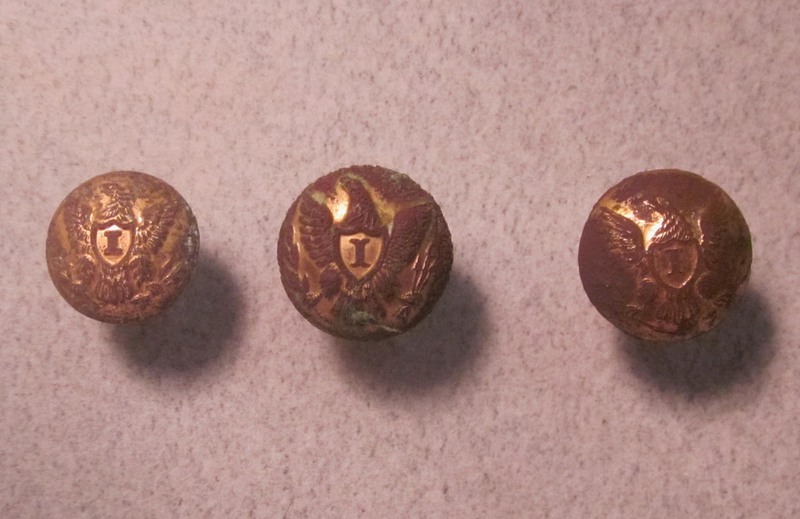 It has lots of gilt remaining, and may have been worn on a hat. The shank is intact, and the dm backmark reads R & W Robinson Extra. Cant find this one in Albert's book. There is a significant dent on the back, which is marginally visible from the front that doesnt affect display quality. 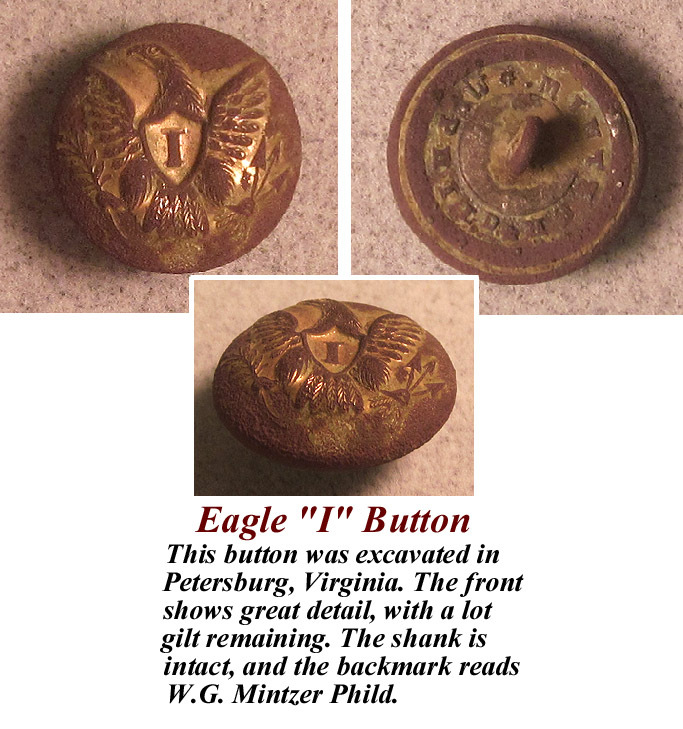 This button was excavated in Petersburg, Virginia. The front shows great detail, with a lot of gilt remaining. The front shows good detail, with some gilt remaining. The front shows great detail, with a lot gilt remaining. The shank is intact, and the backmark reads W.G. 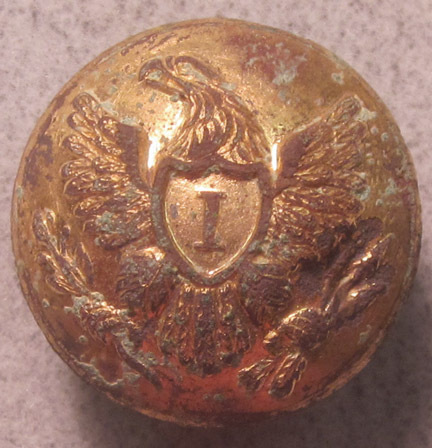 Eagle "I" Button (coat sized). and the backmark reads Extra Quality. 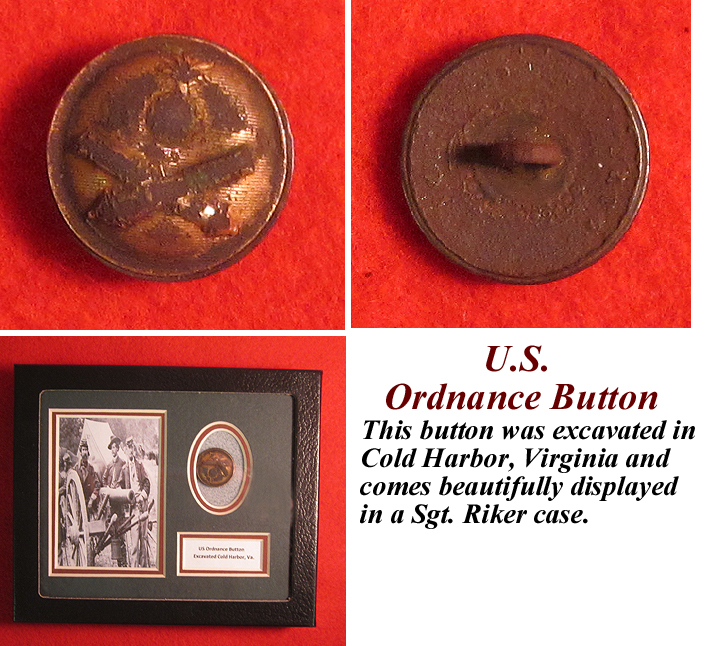 This button was excavated in Cold Harbor, Virginia. Though the backmark is illegible, this button displays beautifully in the Sgt. Riker case which accompanies your purchase. 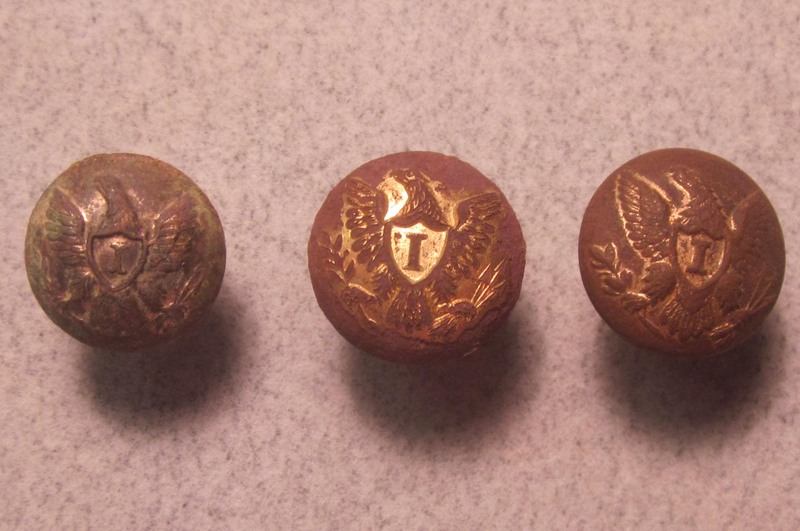 This 13.44mm cuff sized button is from the Seminole Indian War's of the 1830's. 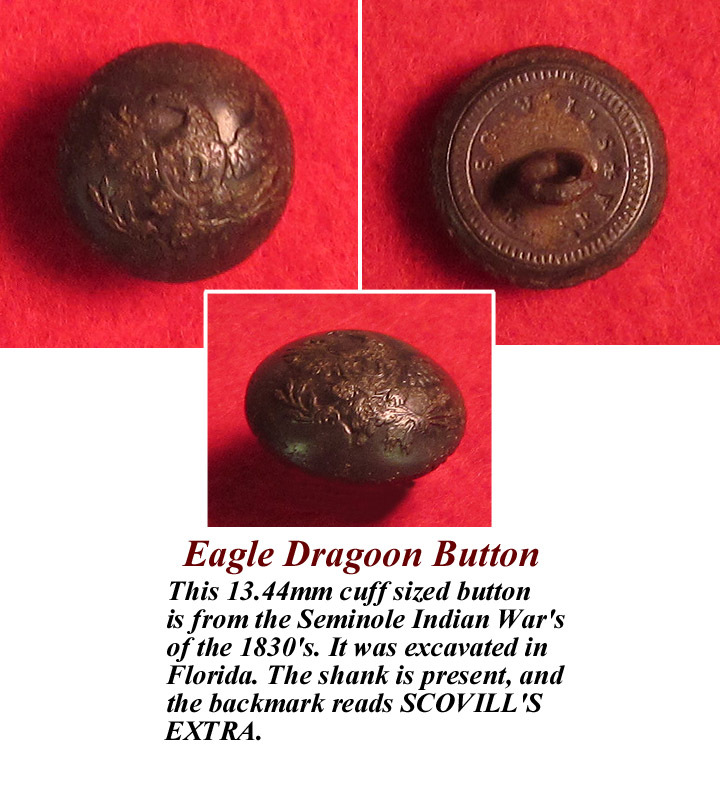 It was excavated in Florida. The shank is present and slightly bent to one side. The backmark reads SCOVILL'S EXTRA. 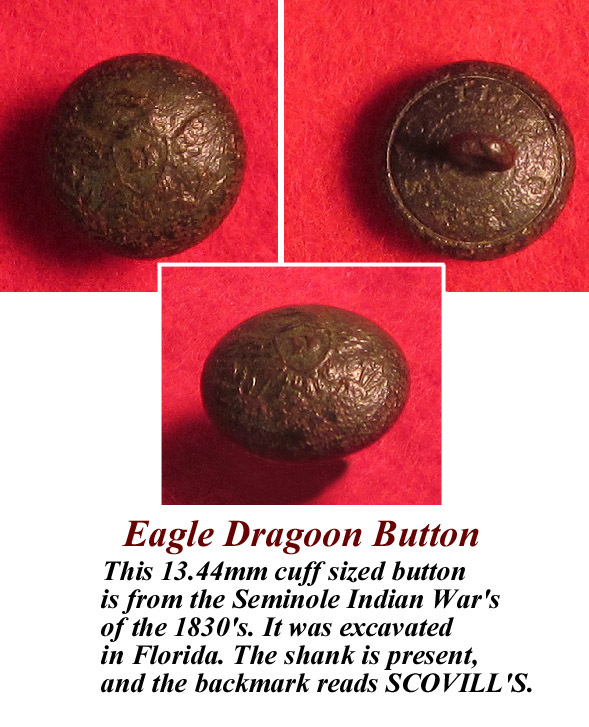 This 13.44mm cuff sized button is from the Seminole Indian War's of the 1830's. It was excavated in Florida. The shank is present, and the backmark reads SCOVILL'S. 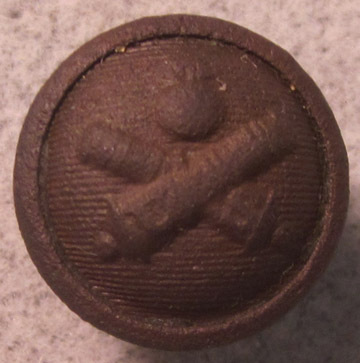 This button was excavated in Williamsburg, Virginia. The face of this specimen retains most of its gilt and displays nice detail. The stand up shank is present and bent. The Scovill backmark is legible, though there is some ground action in that area. It is Albert's number NA112. 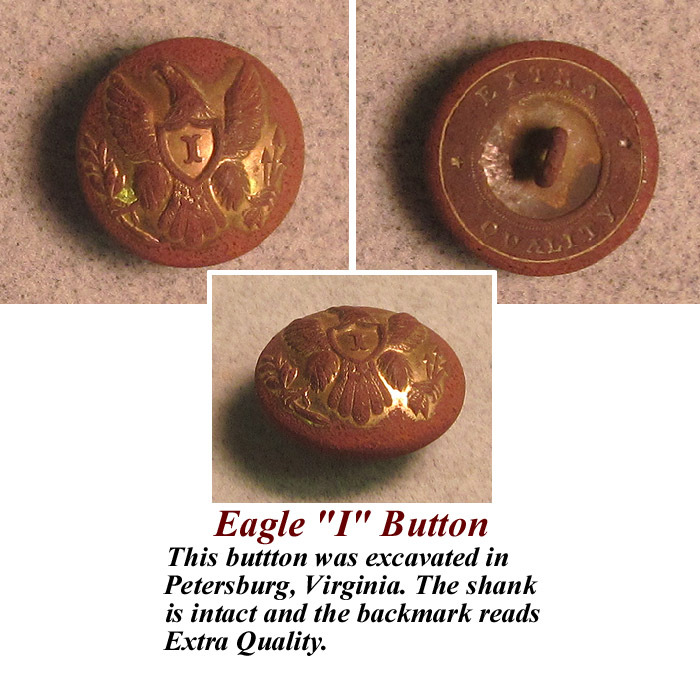 Coat sized Eagle "I" Button. up shank, and is a solid relic. 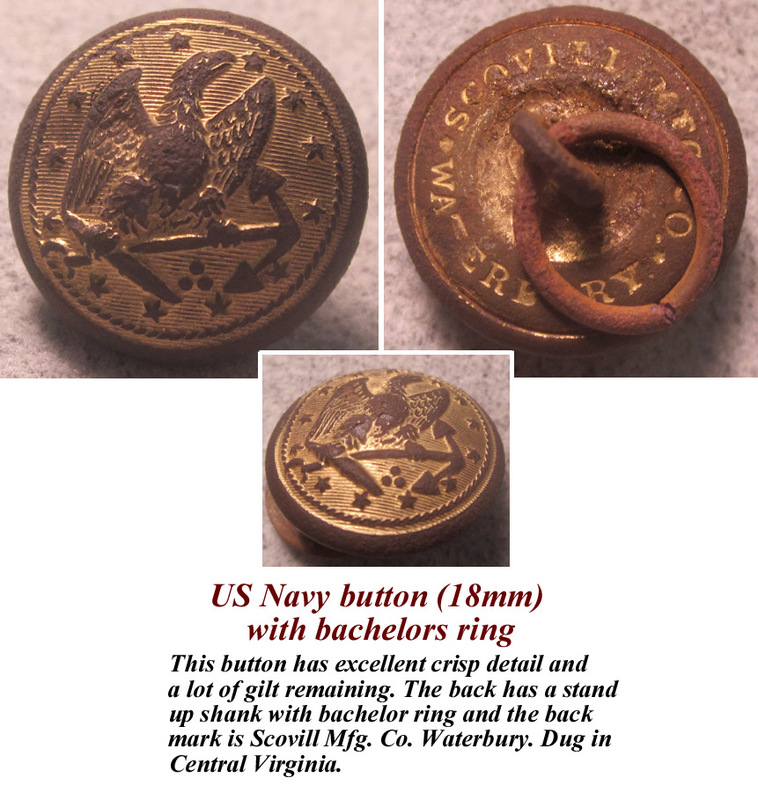 U.S. Navy Buttons with bachelor's Ring. 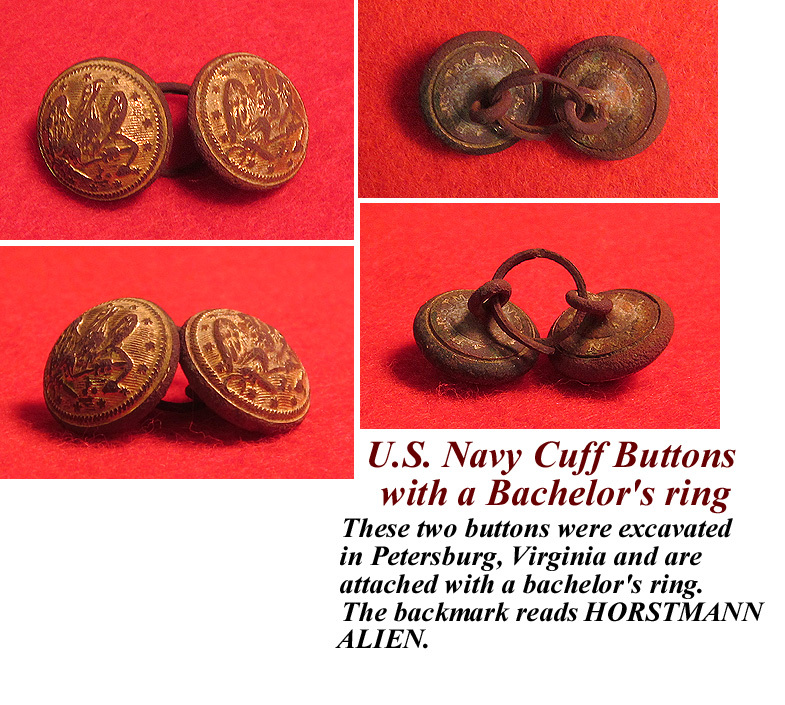 These Navy cuff sized buttons were excavated in Petersburg, Virginia and are attached with a bachelor's ring. The shanks are standing and the backmark reads HORSTMANN ALIEN. 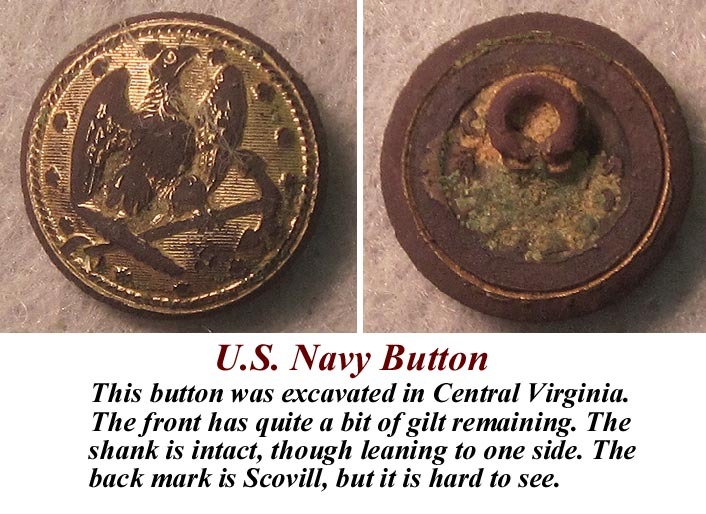 This 18 mm button is backmarked "SCOVILL MFG CO./WATERBURY".